This article is about Lucas' appearance in Super Smash Bros. Ultimate. For the character in other contexts, see Lucas. Lucas (リュカ, Lucas) is a playable character in Super Smash Bros. Ultimate. He was confirmed as a playable character on June 12th, 2018. Lucas is classified as fighter #37. As in Smash 4, Lani Minella's portrayal of Lucas from Brawl was repurposed for Ultimate. 5 Classic Mode: Magic, Sacred Powers, and PSI! Play VS. matches, with Lucas being the 36th character to be unlocked. Clear Classic Mode with Kirby or any character in his unlock tree, being the seventh character unlocked after Corrin. Have Lucas join the player's party in World of Light. With the exception of the third method, Lucas must then be defeated on New Pork City. Lucas received a mix of buffs and nerfs. His combo game was significantly toned down as down throw no longer combos into any of his aerials beyond very low percentages and techable footstools also hinders him. PK Thunder 2 also has halted momentum at the end of its animation which shortens his recovery. Lucas also has a slightly harder time landing thanks to him only being able to air dodge once in the air and PSI Magnet no longer halts his momentum. However, Lucas also received some buffs as his previously lacking mobility is somewhat better, helping his approach. Lucas also has improved specials, aerials, and ground attacks giving him a much more useful ground game, safer aerials, and more useful moves for his neutral game. Ultimate's engine also significantly benefits Lucas. Thanks to changes to air dodges and the return of directional air dodges, Lucas's has another option to mix up his recovery. Furthermore, because players can only air dodge once before landing, and combining it with a retooled PK Freeze, Lucas's edgeguard game is much more lethal than before. Although Lucas's results haven't reached the heights of his fellow EarthBound representative, he had still achieved some great results on a local level, most notably around the MD/VA scene, where his notorious edgeguard had led to some smashers to jokingly ban him. As with all veterans returning from SSB4, Lucas's model features a more subdued color scheme. Similar to Brawl, some of the detailing on his clothes and weapons are more prominent, such as the vertical stitching of his socks. The Rope Snake's scales are more pronounced. Like Ness, Lucas’ stance is now mirrored, always facing the screen regardless of which direction he turns. All of Lucas’ PSI-based attacks are now dominantly light blue. This closely resembles the colors of PK Love in Mother 3. Like Ness, Lucas makes a new face when hit, with his eyes growing somewhat larger and rounder. Like Ness, Lucas's victory theme is now the ending of "Eight Melodies" from both Mother / EarthBound Beginnings as well as "Eight Melodies" from EarthBound layered together. Lucas has a new idle pose where he points to his forehead with his eyes closed with his leading hand then waves it in front of him, similar to Ness's head-pointing idle pose. It replaces the animation of Lucas waving his fists in front of him. Lucas now strikes a different pose during his Seven Needles victory animation. Like all characters, Lucas's jumpsquat animation now takes three frames to complete (down from 5). Lucas dashes faster (1.5 → 1.65). Lucas's initial dash is faster (1.3→1.815). Lucas walks slightly faster (0.85 → 0.893). Lucas' air speed is slightly higher (1.1 → 1.155). Because footstools can now be teched, Lucas's combo game is less varied. All three hits of Lucas's neutral attack have more hitlag. Neutral attack's second hit can be interrupted sooner, improving its potential for mix-ups. Neutral attack deals slightly less damage (8.5% → 7.5%). Dash attack has less startup (frame 15 → 13) and slightly less ending lag (FAF 39 → 38). Dash attack deals more knockback. Sweetspotted forward tilt deals more knockback. Up tilt has less ending lag (FAF 37 → 34). Down tilt has increased hitlag. Down tilt deals slightly more damage (3% → 5%). Down tilt has an altered animation which lowers its vertical range. Forward smash has slightly less ending lag (FAF 47 → 46). Sweetspotted forward smash deals slightly more knockback. The reflector has more startup, though the total duration is unchanged (frame 10-19 → 11-20). Lucas now bends his elbow after each shot of down smash, and his fingers are more pronounced throughout. Down smash covers more range, making it easier to edgeguard opponents. The three hits of Lucas's down smash are now treated as individual hitboxes, thus preventing opponents from shielding one hit and being immune to any following hits. At low percents, Lucas' Down smash hits can connect with each other, doing much more damage. All aerials aside from grab aerial have less landing lag (Neutral: frame 13 → 12, Forward: 12 → 7, Back: 15 → 9, Up: 12 → 7, Down: 24 → 16). Neutral aerial's hitbox is larger. Neutral aerial can no longer be escaped from via SDI. Neutral aerial's multihits have less hitlag, speeding up its execution upon connection. Neutral aerial now deals 4 hits instead of 5, resulting in less damage (12% → 10%). Neutral aerial now sends opponents behind or in front of Lucas depending on which part of the hitbox hits the last hit. This makes it more difficult to guarantee combos with. This change makes it easier to combo with back aerial. Forward aerial's sweetspot deals slightly more damage (11.5% → 12.5%). Forward aerial auto-cancels earlier (frame 38 → 34), enabling it to auto-cancel out of a short hop. Back aerial auto-cancels earlier (frame 39 → 34), enabling it to auto-cancel out of a short hop. Back aerial's animation is faster. Back aerial can now spike grounded opponents. While this benefits from opponents' inability to tech grounded spikes, this takes away Lucas's ability to send grounded opponents offstage from behind him. Up aerial's hitbox is now attached to Lucas's head. A motion trail has been added above Lucas's head to indicate the hitbox's new pattern. Up aerial has reduced ending lag (FAF 46 → 34). Up aerial auto-cancels earlier (frame 38 → 34), enabling it to auto-cancel out of a short hop. Up aerial deals less damage (13% → 11%). Down aerial now connects on aerial opponents more reliably. Down aerial now pushes grounded opponents away from its hitboxes, rather than picking them up from the ground as in Smash 4. Grab aerial has reduced range. Grab aerial has more active frames. Grab aerial deals slightly more damage (4% (clean)/2.8% (late) → 5%/3%). Grab aerial has less ending lag (FAF 60 → 52). Grab aerial can be double jump canceled, allowing Lucas to use it very close to the ground to start combos and approach. The endings of Lucas's grabs now feature interruptible animations during which the Rope Snake doubles back to return to Lucas. 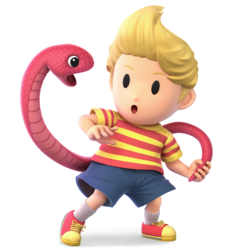 Lucas's animation when holding a grabbed opponent has been altered; he now holds Rope Snake in one hand and uses the other to hold the opponent in place with telekinesis. Lucas now looks angry during his grab animation. Lucas's standard grab range has been decreased. Lucas's standard grab has one frame more ending lag (FAF 46 → 47). Lucas's dash grab has one frame less ending lag (FAF 56 → 55). Lucas's pummel animation now has him attack the grabbed opponent with PSI. Lucas has a new forward throw animation similar to Diddy Kong's forward throw. Forward throw deals slightly more knockback. Lucas has a new back throw animation. Lucas has a new down throw animation. Lucas lifts the opponent in the air using telekinesis, then forcefully slams them into the ground, sending them up and away. Down throw deals significantly more damage (6.5% → 11%). Down throw has more ending lag (FAF 50 → 58), reducing its combo potential at low percentages due to its increased knockback and removes his KO confirm from an up aerial at higher percentages, which was one of his more potent finishers in Smash 4. Lucas's animations during the move have been tweaked; Lucas himself now completely faces the screen, and the particle effects of the explosion now feature the PK Freeze graphic effects from Mother 3. The projectile can now travel through soft and semisoft platforms. PK Freeze no longer dissipates upon making contact with hard platforms and can instead be held at the ground until the move is fully-charged. The projectile now launches opponents at a horizontal angle away from Lucas (no matter which direction he faces), making it better for edgeguarding and KO'ing. Lucas no longer becomes helpless when firing PK Freeze in the air. Lucas's hands now feature a red spark until PK Fire is fired, similarly to his finger in his down smash animation. The same spark appears when PK Fire successfully connects. PK Fire has slightly increased damage (9% → 10%). Lucas's PK Thunder's graphic effects have been changed; rather than maintaining its magenta coloration from Smash 4, PK Thunder has been changed to be varying hues of blue. The move has also gained particle effects which resemble its respective PSI graphics from Mother 3. PK Thunder's electric ball travels faster. Grounded PK Thunder has reduced ending lag. Lucas's momentum at the end of PK Thunder 2 is lower, slightly shortening its recovery distance. PK Thunder 2 has reduced landing lag. PK Thunder 2 deals less damage when all hits connect. PK Thunder 2 last hit now triggers Special Zoom. The window for using PK Thunder again after bouncing against a wall is much bigger. PSI Magnet now features its PSI graphics from Mother 3 upon use. Lucas' back is angled lower in the end of his animation, similar to the beginning of his run animation in Mother 3. PSI Magnet has significantly less start-up (17→7)and ending lag (37→28). PSI Magnet now features a hitbox which drags opponents closer to Lucas's hand on startup. PSI Magnet's launching hitbox is larger. PSI Magnet no longer halts Lucas's momentum in the air. This prevents Lucas from being able to use it to mix up his landing as effectively. Thanks to the changes mentioned above, Lucas can use PSI Magnet in combos. PK Starstorm is now similar to its Brawl iteration, firing meteors inwards towards the center of the stage, but at a slower rate and with slower meteors. His pose during the move no longer reuses Ness's Final Smash animation and is instead replaced with one reminiscent of his animation in Brawl. Lucas is also assisted by Kumatora and Boney. Like his other PSI moves, the move features graphics from PK Starstorm's animation in Mother 3, including the background from the Final Boss. However, the trajectory of the meteors can still be angled. Neutral aerial has less landing lag (14 frames → 12). Lucas possesses a tether attack and grab. 2.5% A right-legged roundhouse kick, followed by a right-legged hook kick, followed by a left-legged reverse roundhouse kick. The last hit has slightly more range. Hits first on frame 2, making it Lucas' fastest ground attack. The first and second hits can jab lock. The second hit can be interrupted sooner than in Smash 4, and lead into a grab or aerial attack. 11% (sweetspot), 7.5% (sourspot) A palm thrust that emits a small blast of PSI energy from his hand. It can be angled and has a disjointed hitbox, although its sweetspot is located inside of the blast. This move's sourspot can lock opponents at low percents. 1.5% (hit 1), 8% (clean hit 2), 5% (late hit 2) Telekinetically tilts himself upside down to perform a vertical thrust kick that emits a blast of PSI energy from his foot. It can combo into itself, a neutral aerial or an up aerial at low to medium percents. 5% A legsweep. Although weak, it is fast and reliable for either racking up damage or chaining into itself, a neutral attack or a grab. Hits on frame 3, making it tied with Ness, Little Mac, R.O.B., and Meta Knight's down tilts for being the fastest down tilt in the game. The edge of down tilt can lock opponents at low to medium percents. 13% (sweetspot), 9% (sourspot) A dashing palm thrust that emits a blast of PSI energy from his hand. Has noticeable start-up and deals more damage the farther the opponent is from Lucas. 14% (base), 15% (tip), 1.5× (reflected projectiles) Swings a stick in front of himself. The stick's tip deals slightly more damage and knockback, while the move overall functions very similarly to Ness' forward smash, including the ability to reflect projectiles. Compared to Ness' version, it has less start-up and ending lag, but deals less damage, knockback and has a lower damage multiplier when reflecting projectiles. PK Smash Geyser 2% (hit 1), 19%, 18%, 16%, 14%, or 12% (clean to late hit 2) Emits a large blast of PSI energy above his head. Despite in-game tips saying it can attack opponents hanging on the edge, this is not true; the completely whiffs most edge-hanging characters unless their head pokes above the edge. It is a huge "high-risk, high-reward" attack; it has an extreme amount of ending lag, which makes it very punishable if missed, but it is strong enough to KO at 80% when uncharged and at 54% when fully charged. It also has other positives, as it renders Lucas invincible on frames 1-4, grants intangibility to his head on frames 15-29 and has a very large hitbox, making it a good anti-air attack if used correctly. The animation appears to based on Lucas' Seven Needles pulling animation. PK Blow 17% (clean), 14% (mid), 11% (late) Aims his arm diagonally downward and emits three consecutive blasts of PSI energy towards the ground while holding his hand in a finger gun gesture. With each blast, its range increases at the expense of damage and knockback. It is one of the strongest down smashes in the game when clean, as it is able to KO as low as 60% near the edge depending on the opponent's weight and DI. If well timed, it can also catch recovering opponents before they grab the edge. Has a bit of start-up lag, but surprisingly low ending lag for its power. Unlike in SSB4, each blast is treated as its own hitbox, meaning that it can potentially hit multiple times at low percents, and damages shields more than once. 2% (hits 1-3), 4% (hit 4) Tumbles while emitting blasts of PSI energy around his torso. A good combo starter. Unlike in the previous game, its launching angle is more horizontal, and the last hit launches the opponent depending on which side they are on in relation to Lucas. 12.5% (sweetspot), 9% (sourspot) A flying kick that emits a blast of PSI energy from his foot. It is is fast and disjointed, making it a good off-stage option and one of Lucas' better spacing options. Its sweetspot deals the most knockback and can KO at high percents. This move's sourspot can lock opponents at early percents. It can also now autocancel. PK Meteor Kick 12% (sweetspot), 9% (sourspot), 7% (late) A backflip kick that emits a trail of PSI energy from his foot. It can meteor smash at the tip of his foot and has disjointed reach, with its weakest hitbox being at the tip. The last hitbox of this move can lock opponents at early percents. It can also autocancel if buffered out of a shorthop. 11% An upward headbutt. The move's hitbox is now properly attached to Lucas' head unlike in SSB4, making it a more reliable attack. Deals respectable knockback, making it a good KO option near the upper blast line. It can also autocancel. At low percentages, it is an effective juggling and combo tool, leading into itself and other aerials on landing. PK Foot Stomp 3.5% (hits 1-3), 5% (hit 4) An alternating series of stomps, with each stomp emitting a small blast of PSI energy from his feet. Like his back aerial, it is disjointed and has a meteor smash hitbox below himself on the last hit, although it is fairly weak. The move itself is also difficult to fully land on smaller grounded opponents, such as Pikachu and Kirby. The last hitbox of this move can lock opponents at low percents. Rope Snake 5% (clean), 3% (late) Unfurls Duster's Rope Snake in front of himself. It can damage opponents and act as a tether recovery. Rope Snake — Unfurls Duster's Rope Snake in front of himself. His standing grab is deceptively fast, although his pivot grab is very slow. 1.3% Attacks the opponent with a discharge of PSI energy. 10% Telekinetically throws the opponent in front of himself. Can KO at high percentages. 10% Telekinetically throws the opponent behind himself. It is his strongest throw. It can KO even super heavyweights at 154% near the edge without rage. 10% Telekinetically whirls the opponent around his head, then throws them directly overhead. One of the strongest up throws in the game, as it KOs around 116%-180% depending on the opponent's weight and DI. 11% Telekinetically slams the opponent into the ground head first. Has significantly less combo ability than it did in SSB4 due to it's higher ending lag. Despite this, it still can combo at 0% on most characters, though the options are very limited. 5% Kicks behind himself and then in front of himself while getting up. 9% Performs a low-angle kick while climbing up. PK Freeze 10%-23% Emits a snowflake-shaped blast of PSI energy from his head that freezes opponents. The direction of the blast's path can be controlled, it can be made stronger by holding the special button and it can be concluded at a deceptively fast speed. A notoriously effective edgeguarding tool, as it launches opponents away from Lucas and has great maneuverability, as well as having a large hitbox. PK Fire 3% (lightning), 7% (fire) Thrusts both of his hands forward to release a lightning bolt-shaped PSI projectile from his hands. Unlike Ness' PK Fire, Lucas' version results in a brief, fiery explosion of PSI energy that launches the opponent away, rather than a long-lasting pillar of fiery PSI energy. It is further differentiated from Ness' version in that it flies straight ahead regardless of whether it is used on the ground or in the air, as well as causing a minimal amount of recoil both on the ground and in the air, making it more effective as a spacing tool than Ness' PK Fire, but less of a combo tool. PK Thunder 2.5% (projectile head), 0.8% (projectile tail, rapid hits), 8% (PKT2 initial), 2% (PKT2 rapid hits 1-5), 1.5% (PKT2 rapid hits 6-10), 10% (PKT2 last) Emits a streaming, electrical PSI projectile from his head. Like Ness' PK Thunder, it can be directed into Lucas to launch him at a high speed. Unlike Ness' version, however, it does not disappear after hitting an opponent and instead hits multiple times, giving it damage racking potential. This effect also applies PK Thunder 2, with Lucas hitting an opponent multiple times upon colliding with them. Deals immense damage if all of PK Thunder 2's hits connect, making it one of the most damaging up specials in the game. It is also a versatile recovery option if used correctly, as it covers great distance while being hard to properly counter itself due to its multi-hit and intangible properties. PSI Magnet 8% (ending), heals 2.5× the damage of absorbed projectiles (maximum 30%) Thrusts his arm forward to emit a glowing orb of PSI energy around his outstretched hand. Any energy-based projectiles it absorbs will heal him, although it no longer absorbs energy projectiles that are launched directly at his back as it did in Brawl. It can also be used offensively, due to it dealing damage and semi-spike knockback to opponents inside of it when it dissipates. The move now has a windbox box that drags in opponents near it. PK Starstorm 6.5% (per hit) Boney and Kumatora join Lucas, who summons a shower of falling stars that fly towards the center of the stage, damaging opponents in range. The trajectory of the meteors can be angled left and right. Unique to Lucas' version of PK Starstorm, the range of the meteors can also be adjusted. Tilting the stick up causes the meteors to spread out near the top of the screen (this will allow the meteors to hit opponents closer to the upper blast line, but will miss any who are grounded); tilting down causes the meteors to slightly angle outwards as they fall towards the stage (if done from the center of Final Destination, the meteors will cover almost the entirety). Overall, it has far more control than Ness's version. Rides in on a Mr. Saturn-style coffee table, then hops off. The table is based on the one that Lucas rides in order to reach Saturn Valley in Mother 3. Trips, shakes his head, and gets back up. Duster's Rope Snake taps Lucas on the shoulder and has a brief conversation with him, as Lucas shrugs at it. Positions his right hand up to his forehead and grunts while generating small bursts of PSI energy from his index and middle fingers, then swings his hand down to emit a trail of PSI energy. Taps the toes of his shoes on the ground. Holds one finger to his forehead, and then swings his arm outward. Forcefully pulls one of the Seven Needles out of the ground, sending it flying off-screen while Lucas looks toward the screen in a battle-ready pose. With his back toward the screen, he crouches while poking at something on the ground with a large stick. After the camera zooms in, he then turns his head around to face the screen and says "Huh?" while briefly sporting a surprised expression. Bends down on one knee and waves his right arm in from himself while releasing blasts of PSI energy from his index and middle fingers. A flourished combination of the final two out of the Eight Melodies in Mother / EarthBound Beginnings. Classic Mode: Magic, Sacred Powers, and PSI! All of Lucas' opponents have some sort of magical abilities. Although Lucas does not appear in the World of Light opening cutscene, he was vaporized and later imprisoned alongside the rest of the fighters (sans Kirby) when Galeem unleashed his beams of light. Lucas can be found on a village covered in fog as a callback to his home of Tazmily Village. Lucas's Fighter Spirit can be obtained by completing Classic Mode. It is also available periodically for purchase in the shop for 500 coins. Unlocking Lucas in World of Light allows the player to preview the first spirit below in the Spirit List under the name "???". As a Fighter Spirit, it cannot be used in Spirit Battles and is purely aesthetic. Each Fighter Spirit has an alternate version that replaces them with their artwork in Ultimate. Lucas using his Rope Snake on Skyloft. Lucas freezing Ganondorf on Summit. Performing PK Fire near Entei on Great Bay. Using PSI Magnet near the Black Hole item on Skyworld. Lucas holding a Master Ball on Castle Siege. Lucas getting pummeled by Richter on Skyloft. Lucas approaching Gray Fox on Golden Plains. Lucas and Diddy Kong being attacked by Marshadow on the Bridge of Eldin. Lucas getting attacked by Rathalos on Garden of Hope. Snake with Lucas' Rope Snake on Pokémon Stadium 2. Because Lucas' PSI-based attacks are light-blue, this makes it inconsistent with his artwork seen in the Panoramic illustration featuring all of the fighters which the PSI-based attack was the former colored pink and yellow. Lucas' character portrait is based off of his side taunt. Lucas is in Kirby's Classic Mode unlock column, the same one as Ness. Lucas is the first and only Brawl newcomer to receive a completely new victory theme. This page was last edited on April 19, 2019, at 11:36.